For our list of the top rated hoverboards only UL2272 certified, US brands have made the cut, so you can be sure that these are safe to enjoy for you and your family! And although our choices are tried and tested, we always recommend you click through to Amazon to check out other customer reviews to help you make your decision. Now without further ado, here are our top picks. Whether you want bluetooth, off road capability, a mini segway, or just one for the kids – you’ll find there’s something for everyone. Like most people, we are aware that the hoverboard industry got off to a somewhat rocky start when they first became popular in 2015. Due to massive demand, factories in China were churning out thousands of scooters and unfortunately some had little regard for quality or safety. Cheap, inferior materials and generic batteries led to some incidents of overheating, batteries catching fire, and fire damage to customers homes. I’d like to say that this isn’t happening anymore, but unfortunately hoverboard fires ARE still occurring. HOWEVER, this is only an issue with older uncertified boards with unsafe batteries and these are isolated incidents. We only recommend UL 2272 certified hoverboards which ARE safe! With its timeless black hue and robust wheels, this hoverboard looks extremely slick and sturdy. 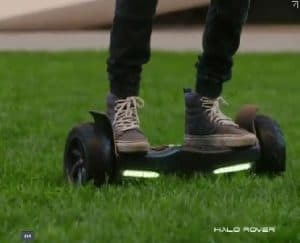 This is one of the new generation of off road hoverboards, which can travel over a variety of terrains from sand, to grass, to snow and much more. It is tough and durable but also very easy to use. Designed for use by riders aged 7 and up, it can be enjoyed by children and adults alike. Learning, Intermediate and Advanced modes - set it to beginner as you are just starting out, before ramping things up to Intermediate or Advanced. Battery life of 2 hours should be enough to get you to and from work or school in style every day. For more info read our comprehensive Halo Rover review. 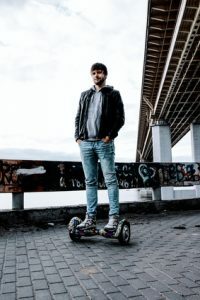 There's no denying that Swagtron is one of the biggest names in electric rideables, and with a number of different hoverboards in their T series, there's plenty to choose from. Their 2017 release though, the T580 (which we are reviewing here) is by far the most popular (and highest rated) right now. Although it's a great board, we didn't name it the best hoverboard because although it has most of the key features that the Halo Rover has - including Bluetooth capability and a mobile app, as a traditional hoverboard it is unsuitable for off road use. If you're not interested in off road riding though this might be the one for you. Not as powerful or versatile as an off road hoverboard. This is a good solid self balancing scooter suitable for anyone from about the age of 7 to adults of all ages. It was one of the most popular hoverboards in the run up to Christmas 2017, and its likely to remain so throughout 2018 as Swagtron is a well known and popular US brand. Although we've already mentioned the Halo Rover as our top pick (which is also an off road hoverboard), we couldn't have a top review without mentioning the Epikgo. This comes in Classic Edition, Sport Edition and Sport+ Edition (all with slightly different features, and different prices). In this review though we're just going to talk about the most popular Epikgo Classic. 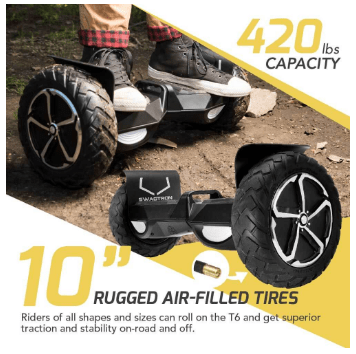 30 % larger than a standard 6.5 inch wheel hoverboard, and undeniably more powerful, this beast of a board is well worth checking out if you're looking to go off roading over sand, gravel, snow or grass. Tackles inclines of up to 18 degrees. Terrains that this board has been designed to cope with include sand, grass, mud and dirt. Strong, durable and powerful (in fact its advertised as being "indestructible!" 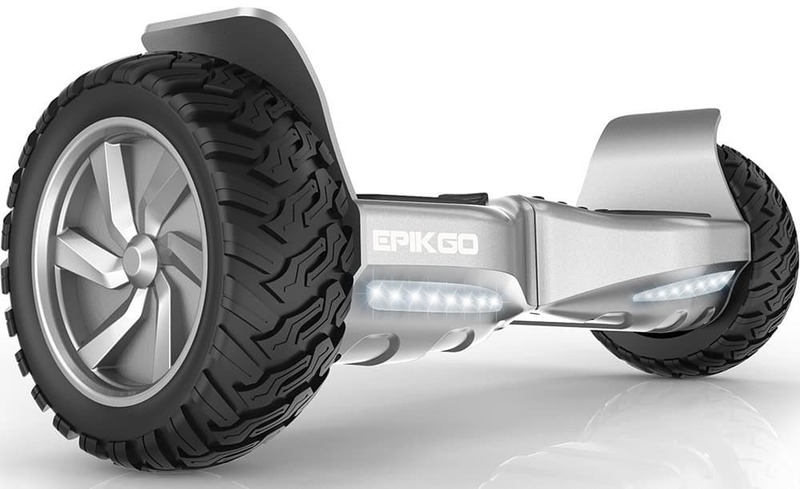 The Epikgo truly is an "epic" board if you want to try riding a variety of terrains. It's tough, durable, and is made to withstand quite a battering. It's even great in light rain and puddles which a lot of other self balancing scooters are unsuited to (although I still wouldn't ride it in heavy rain). The only thing missing is bluetooth capability, a mobile app, and built in speakers (which the Halo Rover has, but is also more expensive). For a lot of riders though this won't be an issue as this board is made for riding, not listening to music! Plus at approx $100 cheaper it might be worth forgoing these (unnecessary?) extras anyway. Or you could opt for the Epikgo Sport or Sport PLUS which do have them - but for an added fee. A few years ago it was difficult to find a decent pick for budget best hoverboard because as soon as you went below $200, the product reviews tended to be poor (I guess you get what you pay for, right?). For instance one of the most popular budget hoverboards for Christmas 2017 now has a bunch of 1 star reviews from people who were disappointed with how it worked (or didn't work). Obviously with the warranty its possible to get refunds or replacements, but its hassle that you don't need - especially if you bought it as a gift! However there are some good options available in 2018 that are in this price range and worth a mention. The CHO is quite good and costs less than $200. I don't know how long that price will last though, so I may have to update my "budget choice" if the price goes up. For now though, the CHO is my budget recommendation and is a good entry level hoverboard. This is a UL certified 6.5 inch hoverboard currently only for sale on Amazon. I've seen a lot of hoverboards that cost under $300, and some even under $200, and to be honest I haven't been impressed by the user reviews. Amazon and Walmart have plenty sellers selling cheaper boards from unknown brands, and they rarely are up to standard - that's why I always recommend choosing a well known brand with GOOD reviews. Remember just because a board is UL 2272 certified, doesn't mean its reliable or performs well - the testing is only for fire and electrical safety (so they won't go on fire). The CHO hoverboard is our top pick for this category (for now) - if the price increases or the hoverboard reviews disimprove I'll certainly rethink my options for budget buy. Right now though I consider this to be a good buy for less than $200. It's not the best hoverboard ever, but for someone new to hoverboarding who wants to test their skills, or as a gift for a kid this is pretty good. This is a standard size 6.5 inch hoverboard designed especially with younger kids in mind. Coming in a vibrant color scheme with colors such as black, blue, pink, purple and more, you'll find a color to suit most kids tastes. The Hoverfly ECO is not the most expensive hoverboard on the market (coming in at under $200) but it doesn't have bells and whistles such as bluetooth or a mobile app. 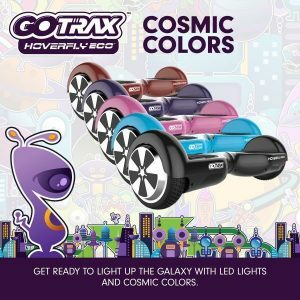 Younger kids are unlikely to make use of features like this anyway - all they want is a board that looks good, travels well and parents will value the safety and durability that a Gotrax hoverboard provides. Denver based company Gotrax has fast become one of the top manufacturers of rideables in just one short year. In terms of quality and reliability its up there with other popular brands like Swagtron and Razor. The Hoverfly ECO is perfect as a starter hoverboard and is very affordably priced. Well worth checking out if you're buying for a young member of the family. Razor are one of the top brands on the market for electric rideables, having brought many of the most popular electric scooters to the market in recent years. Their hoverboard, the Hovertrax 2.0 has a real disco style feel to it. Equipped with lights and able to spin for up to a minute, it is also a very safe board and was one of the first to achieve UL 2272 certification. A lot of people love the razor design on the wheels that make this brand instantly recognisable. This board is designed to maximise the balance factor. It is equipped with Everbalance technology which makes it easier to turn, is also auto self balancing (which makes it a really safe option for kids). Suitable for ages 8 and up, it can be set to two different modes, namely Training and Normal so you can set the board to suit your skill level. The two blue LED light bars lend a fun and funky feel. When buying a hoverboard for a child you want the absolute best and safest board you can find, one that's durable, fun and looks "cool" too. Razor brings that with the Hovertrax 2.0. Being one of the most trusted brands in personal transportation (they're big in electric scooters etc.) my expectations were high for the one hoverboard that they've brought to the market, and I must say I'm not disappointed! On the Razor website they call it the "world's smartest self balancing scooter" - now I don't know if that's true, but on testing it out, it definitely rides smoother than some other similar size hoverboards on the market. This is probably due to their exclusive Everbalance technology which provides intelligently engineered auto self balancing making it easier for beginners or kids to mount and ride. Tomoloo are a US brand that is one of the fastest growing companies in the world of electric rideables, set to rival Swagtron & Razor. They offer a wide range of products, free 2 day shipping, and a 30 day money back guarantee! Some people will love the design like I do, but it might not be everyone's cup of tea. The bright LED lights are probably going to appeal more to the younger generation. These are stunning looking hoverboards and I must admit I absolutely love the design, and particularly the brightly colored LED lights. 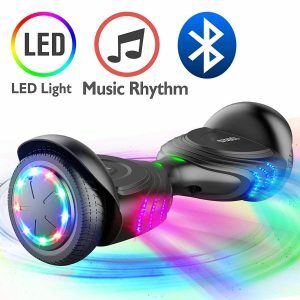 They're one of the fastest hoverboards available, are fully UL2272 certified, come with bluetooth technology, and a mobile app you can use to control various aspects of the functionality. Its got really great reviews on Amazon which are definitely worth checking out before you buy. The Swagtron T6 came to the market in 2017 and has proven to be one of the most popular off road hoverboards, especially with adults. Right now this is the ONLY hoverboard on the market designed to carry a weight capacity of up to 420lbs. No other hoverboard right now can carry anything more than 300lbs, so the T6's weight capacity is its main USP. Available right now in Desert Tan, Black and Pink Camo, anyone over the 300lb weight mark who wants to ride a hoverboard now can! This is THE best hoverboard for big guys and riders of all shapes and sizes, but its actually suitable for kids too so the whole family can ride it! It's the best choice available for anyone over the weight of 300lbs - this has a max capacity of 380lbs. Mobile app and bluetooth connectivity - listen to music while you ride! Swagtron aren't known to be the easiest company to work with if you have a problem and need to return (you have to do so at your own expense). The easiest way to get around this is to buy from Amazon rather than the official website. It's too new for us to say, but Swagtron might just have pulled it out of the bag with this new off road scooter they've brought to the market. The Swagtron T6 is seriously strong, durable, powerful, and rugged enough to tackle a variety of terrains. Its advertised as being the only hoverboard on the market that will carry a weight of up to 420lbs, and if this is the case then its out there on its own as a hoverboard that will suit almost anyone. And its not just for heavier adults - even kids can use it! One more thing we've got to mention - the price for this is awesome. Cheaper than most of the other off road hoverboards on the market. Maybe it's a special offer seeing as its new to the market? 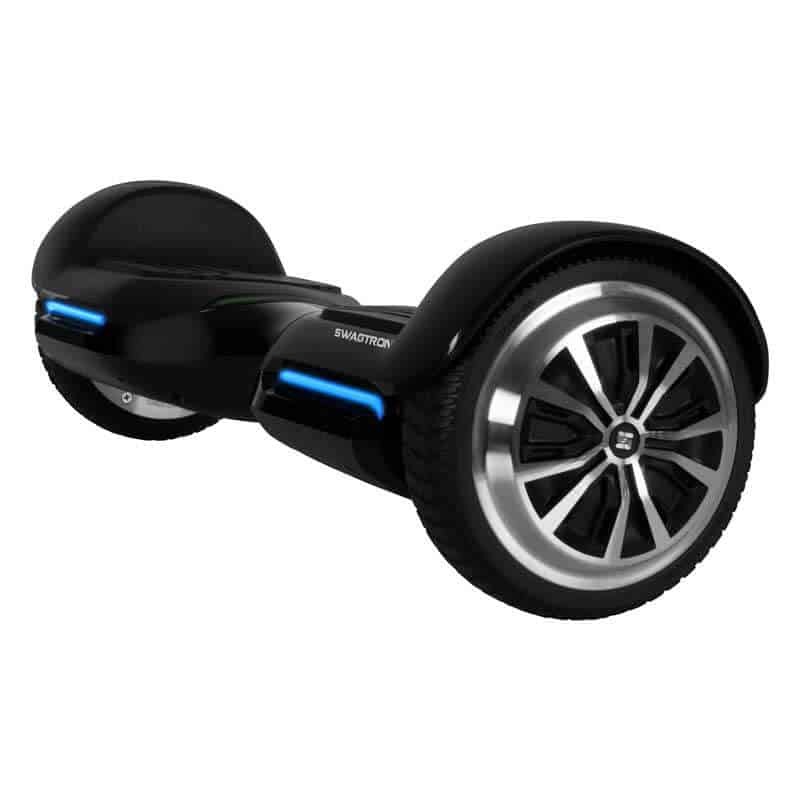 If you want an all terrain hoverboard for a very reasonable price with the works, try this. I doubt you'll be disappointed! The Segway Minipro was released in 2016 and was one of the first rideables with UL2272 certification. The Segway brand needs no introduction, and combined with Ninebot they have come up with a hoverboard "evolution" that looks like a mini "segway" with a knee bar. This is more of a "personal transporter" than a toy, although its suitable for kids as well as adults. Many older adults with decreased mobility have found it a useful way to get around quickly and safely. It's quite easy to learn. The knee bar (which is adjustable for your height) allows your to maneuver more precisely and easily than other scooters and hoverboards - all you have to do is gently press left or right with your knee. It is removable for easier transportation (e.g. in the trunk of your car) but you can't ride the Minipro without it. The air tires make for a more stable and comfortable ride, and are suitable for indoors and a variety of outdoor terrains. Has customizable LED lights for superior visibility, day or night. Free app enables remote control operation, speed control, vehicle diagnostics, anti theft alarm, customizable lights and more. Price is now half what it was when it was released in 2016! The Segway Minipro is a great option if you're looking for something that's a bit more powerful and easier to use than the average hoverboard. Judging by the reviews people of all ages are using it, and its especially good as a transportation device as it travels up to 14 miles on a single charge. In the first half of 2016 there was only 1 or 2 hoverboard brands that had received UL certification, so the choice was easy! Since then though many top brands (and some unknown ones) have undergone the testing and got their UL2272 certification. So now it's a bit more difficult as there are a lot to choose from! Of course that can only be a good thing, as this has also driven prices down a bit since last year. Starting from around $200 (although its possible to find some a bit cheaper) this isn't a small purchase, but if you take some basic guidelines into consideration you should be able to find the best self balancing scooter 2018 for your requirements. Consider US brands first e.g. Swagtron, Razor, Gotrax, Halo Rover etc. - it's just easier to deal with customer service, warranties etc. if you have an issue. Read user reviews before buying. Amazon are great for customer reviews - also Best Buy and Walmart. Take minimum and maximum weight capacity into consideration. Minimum weight for most hoverboards is approximately 44lbs. Maximum weight capacity can be anything from 220lbs to 420lbs so shop around to get one right for your weight. Most hoverboard manufacturers advise a minimum age of 8 years for using a hoverboard. Some advise their hoverboards should be used only by age 13+. Younger children should always be carefully supervised if using a hoverboard as they can be dangerous if not used properly. Check your hoverboard's weight before buying. Some can weigh as little as 22lbs, but bigger scooters such as the all terrain ones can weigh up to 35lbs. If you'll need to carry it any distance this isn't light! Don't buy a hoverboard that isn't UL 2272 certified. If it doesn't mention this certification on its website or product listing, then it probably doesn't have it. You can buy with confidence from marketplaces like Amazon that ONLY allow the sale of UL 2272 certified transportation devices. ... and lots more. This electrical and fire safety testing will ensure that your self balancing scooter is in NO DANGER of catching fire. 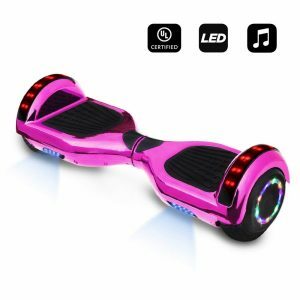 If you purchase a hoverboard WITHOUT UL 2272 certification there is no guarantee that it will be safe. 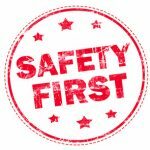 Many of the hoverboards we recommend are sold on Amazon, and this is because ALL hoverboards sold on Amazon meet this safety criteria. Since early 2016 Amazon no longer allow the sale of hoverboards that aren’t UL certified due to fire safety concerns. All sellers of hoverboards and e-mobility devices must show proof of this certification before they are allowed to list their product. So you can be confident that if you buy your hoverboard there, it WILL have full UL 2272 certification. 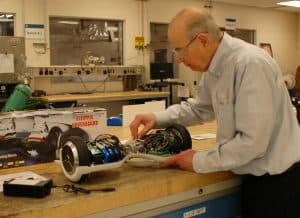 Now although a hoverboard will have undergone strict testing procedures for fire and electrical safety, UL 2272 doesn't evaluate for reliability, performance, or rider safety. So you should still take your own precautions when using any personal e-mobility device. Always buy UL certified - the product should have a UL mark on its packaging and UL certification holographic sticker on the bottom. Use personal protective gear when riding e.g. a helmet and knee pads. These are especially important for younger kids who might need extra practice balancing in the beginning. Only use the charger that came with your hoverboard - do not use a cheap generic charger as these can be dangerous. If you need a replacement charger, go to the manufacturer to get the right one. Do not overcharge your hoverboard - follow the manufacturer's recommended charging time. Don't leave a scooter charging unattended overnight. Do not charge your e-mobility device near flammable materials. Read the manual that comes with your hoverboard and follow the manufacturer's safety guidelines, including charging advice, how to look after your hoverboard etc. Hoverboards aren't really suitable for younger children. Most hoverboards advertise a minimum age of 7 or 8, but realistically, they can be dangerous for anyone if not used properly. It's very easy to have a crash or fall if reaching top speeds. 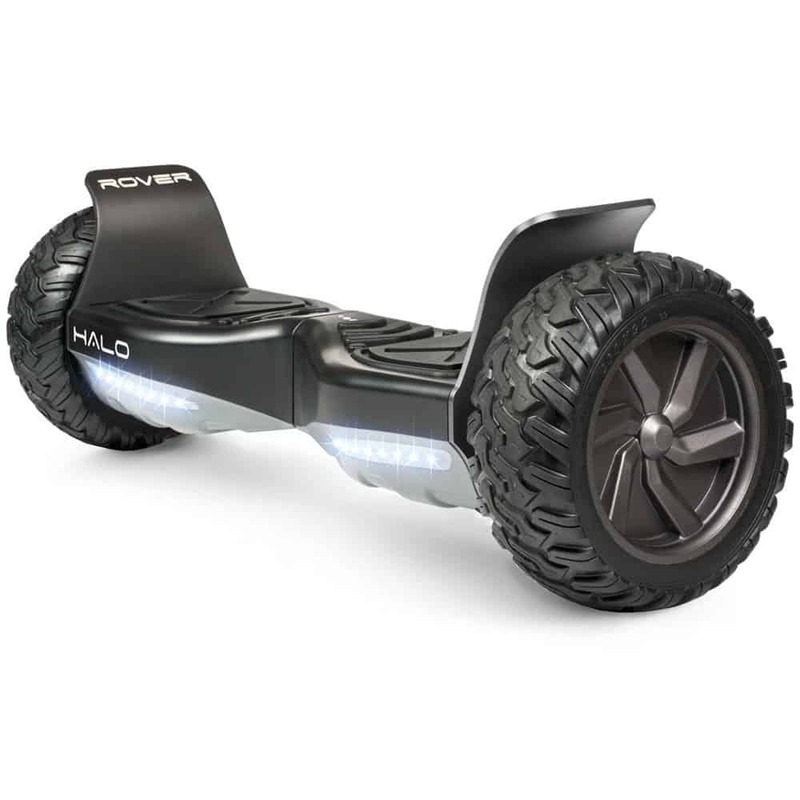 The overall best hoverboard on this list is the Halo Rover board. This is because this board offers a great speed and range, good durability and fantastic balance. If you would like an all round board that looks good, gets you quickly and cleanly to where you want to be and is great for travelling just about anywhere - from a day on the golf course, to cruising around on the beach, to commuting to work or school, this might be the one for you. It's not the cheapest available, but you get what you pay for. And at under $450 it's still a bargain for an off road hoverboard! As you can see from our hoverboard reviews, all of the hoverboards reviewed here have something great to offer. So, deciding which hoverboard is best for you will depend on what your precise needs are. One consideration is how good the app associated with the board is - do you want to stream tunes from your iPod as you ride the board? Do you want to be able to find the board with a couple of taps on your touchscreen device? Do you want to be able to track your route? However, there are many other factors to bear in mind. If it is important to you to be able to ride the board over unconventional terrain, for instance, branching out from the pavement to the beach, the dirt tracks or muddy fields, then the EPIKGO , Swagtron T3 or Halo Rover scooters are great options. If however they are a little beyond your budget, the Xtremepowerus Off Road hoverboard is quite a bit cheaper but still a good all terrain board. 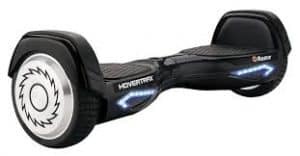 Moreover, whilst many of these boards can be used by adults and older kids (for instance kids aged 7 and 8 upwards), if you are looking for a board that is especially safe for young kids, the Razor Hovertrax board is a nice choice as it is extremely stable with exclusive Everbalance technology. Finally, you may be keen to get the best sound quality with your hoverboard. In this regard, the Tomoloo hoverboard is probably the best choice as it sounds amazing and is highly customizable, too. This is a board with real personality and an excellent option for anyone who loves music. So, in sum, all of these boards are fun to use, and all of them use top gyroscopic technology to ensure that balancing, reversing and turning are safe and easy. All of the hoverboards that feature on this list have been carefully selected because they are among the very best hoverboards in 2018. Though every board has something unique to offer, moreover, there is one that stands out as a clear winner - as has been mentioned above. And, this is the Halo Rover hoverboard. I hope you’ve found our hoverboard reviews useful and now know which is the best hoverboard to buy for yourself or as a gift. If you have any questions or would like any other products reviewed please comment below and I’ll do my best to help. Thanks for reading!